a carcinoma arising in the adrenal cortex that may cause virilism or Cushing syndrome. a malignant neoplasm of the adrenal cortex that may cause adrenal virilism or Cushing's syndrome. Such tumors vary in size and may occur at any age. Metastases frequently occur in the lungs, liver, and other organs. A carcinoma arising in the cortex of the suprarenal gland that may cause virilism or Cushing syndrome. One obstacle is a common microscopic cystic appearance that can be confused with adrenal cortical carcinoma. 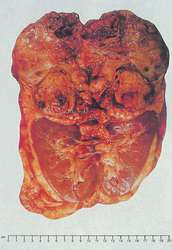 2), adrenal cortical carcinoma, and renal angiomyolipoma. ChRCC can be confused with clear cell renal cell carcinoma or oncocytoma and several non-renal tumours with overlapping features including hepatocellular carcinoma, adrenal cortical carcinoma, lung carcinoma, and oncocytic tumours of salivary gland and thyroid. Just 18 months earlier, I had been diagnosed with a rare and terminal cancer, adrenal cortical carcinoma. Darren and I fill each precious moment with love, fun and laughter; EXCLUSIVE Newlywed Victoria Cornish tells how she and her husband have learned to cope with her rare, incurable cancer. The beautiful Midland bride, 28, has been told by doctors she has a rare and incurable form of cancer, called Adrenal Cortical Carcinoma (ACC). Adrenal cortical carcinoma (ACC) is an uncommon aggressive malignancy with a bimodal age distribution with a first peak in childhood and a second in the fifth decade. Orphan drugs are intended for the prevention and treatment of very serious rare diseases such as chronic myeloid leukaemia, pulmonary arterial hypertension, gaucher disease and adrenal cortical carcinoma. Will Big Pharma Embrace Orphans? Mitotane use in inoperable adrenal cortical carcinoma. Adrenal cortical carcinoma is a rare tumor in the pediatric population (age 0-21). It was also just a few months after Gaskins was told she had one year to live after being diagnosed with adrenal cortical carcinoma - a rare cancer that starts in adrenal glands, just above the kidneys - and shortly after she underwent surgery to remove a 10-pound tumor and her right kidney. Adrenal cortical carcinoma, the most common primary adrenal malignancy, causes only 2% of tumors less than 4 cm in size, yet it causes 25% of tumors larger than 6 cm. 111) Some carcinomas may show markedly reduced or loss of expression of a broad spectrum of cytokeratins CK7 and CK20, including RCC, HCC, adrenal cortical carcinoma, anaplastic carcinoma, medullary carcinoma of the colon, and metaplastic breast carcinoma.